In case anyone else is in the same situation, the remanufactured power steering pump from Autozone fits and works with the Speed6. The dealer lists a different part number for the regular 6 and Speed6, but Autozone lists the same part so I was concerned. It works fine and cost a quarter as much. 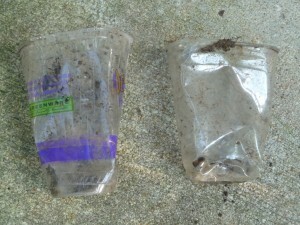 The compostable cup is on the left, with the control cup on the right. They don’t look too much different to me. 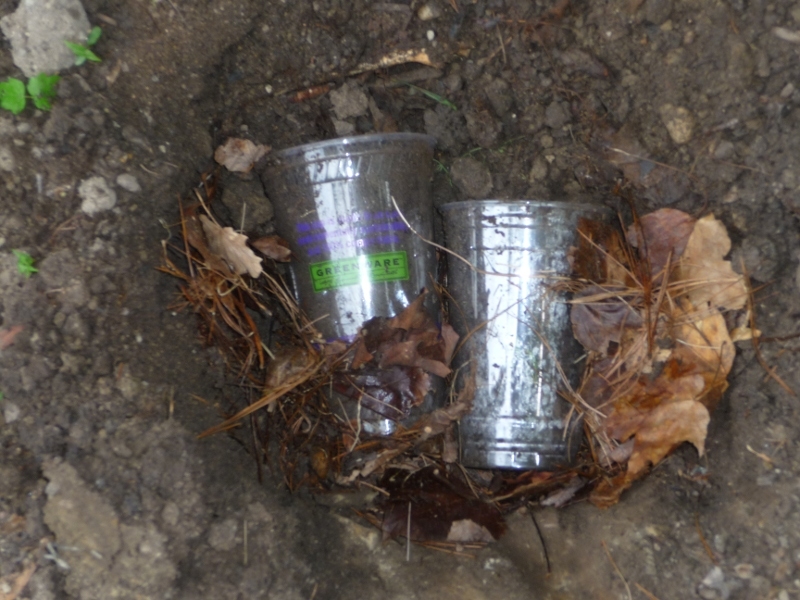 There are more cracks in the compostable cup, but that might just be due to different mechanical properties or having been abused differently in the burial. I have reinterred both cups. We’ll see what happens. Having read some more about compostable plastic, I am not optimistic. It can decompose in a warm compost heap into nothing but carbon dioxide and water, but when buried without air it can anaerobically become methane, which is a worse greenhouse gas. If cups are going to be put into landfills, it’s probably better if they’re normal plastic and don’t decay. This will at least sequester the carbon. Still, for the sake of my experiment, I will leave this one in the ground. What’s a little methane between scientists? Tuesday we were scheduled for the Badlands, but first we went back to the bagel place in Rapid City. They recognized us and I joked that we were practically regulars. We had decided to go via route 44 and then into the west side of the park via Sage Creek Road rather than do the more standard I90 route. We got to Scenic, SD and were a bit confused about the roads as listed on the sign. I stopped and asked directions in one of the two or three buildings in Scenic. Turns out that this Sage Creek Road is a gravel road. John was mostly asleep and I didn’t want to drive on gravel so I decided to continue on 44 to Interior, SD on the other end of the park — but I took the wrong road and we ended up on 27, which went into an Indian reservation and to a White River visitor center at the southern end of the park. Spoke with the ranger there, who was most likely American Indian and had a cool accent. She explained where we were and said that Sage Creek Road, while gravel, was a decent road. John said he was willing to drive it, so we went back and took it. Despite having screwed up, I was glad that we had seen this even more sparse area south of the main park. We stopped at just about every viewpoint and took some pictures, or at least looked around. It is really hard to do justice to this scenery, especially since we had ignored advice to buy a really wide angle lens before taking this trip, but we may have gotten a few good pictures. We saw some mountain goats, though at least one of them was tagged and walked up into the parking lot, so they weren’t exactly wild. Their coloring struck me – they were a light brown that matched the rocks, and their eyes were the same, or maybe reddish. We also stopped at one viewpoint that was prairie. I loved the contrast between the green, grassy, flat prairie and the brown, arid, vertial rocks and buttes. We ended up at the fossil viewpoint/exhibit, which seemed to be the major attraction in the park, and walked around there a little bit, taking pictures. Even this section of the Badlands was far less crowded than anything we saw in Glacier or Yellowstone. It was probably around 5 or 6 by then. We considered staying ’til sundown, when the light would have been stunning, but we were both tired and wary of driving to our next stop via country roads without a map in the dark, so we decided to move on. Headed south towards Alliance, NE, home of Carhenge, which was our last stop before heading home. The iphone had no signal and we didn’t quite have a paper map of southern SD. The one we had of the Badlands had a road that said it headed to a town called Martin, and the one of Nebraska had a road coming *from* Martin, but neither of them actually showed Martin. After we started, I remembered that I had a real GPS and got it out. Interestingly, we never actually went to Martin. The GPS sent us through the same reservation we had been to before and on a road or two that were BIA (Bureau of Indian Affairs) roads. At maybe 9:30 or 10 PM, when we were almost to Alliance, tired, and just wanting to be there already, we got caught on a tiny road behind some big thing that seem to be perhaps full of grain. In front of it was something even bigger that we eventually figured out was a combine. They were going maybe 10 or 15 miles/hr, and because the combine was huge we could not pass them. Eventually they got caught on a bridge and completely stopped. We stopped. Someone from behind us ran forward to see what was going on, then the trucker behind us came to talk to us. He was maybe around our age, maybe younger, with a cigarette, hauling 60 head of cattle to Scotts Bluff. He was from Minnesota and had the accent to match. He said if his cell phone had signal he would have called the cops. Even mine, which has had signal most of the trip, did not have any at that point. The person who had run forward turned out to be another trucker, a very thin woman also maybe our age. She was quite pissed at the situation and eventually went back, along with the other trucker, to try to help them get through this impass. One of the truckers told us that there is a $3600 fine for driving a combine on real roads. Eventually I think they pushed the sign that was in the way aside and got the things over the bridge, at which point it finally pulled over to let us all pass. The guy with the cattle truck followed us all the way to Alliance, then kept going to Scotts Bluff. In the morning we went to Carhenge, which I had found in a book about travel off the interestates and we had decided we had to check out. Walked around and took some pictures. Went to the visitors center/gift shop and got some iced tea and chatted with the woman working there for a few minutes. Went back to Alliance for lunch but unfortunately it wasn’t very good at all. (This made me realize that almost everything else we ate on this trip has been fairly-to-really good.) Got on the road towards home, heading east on Rte 2. There was some construction here and there – there has been lots on this trip, and I wonder if any of it is from stimulus money. The road was listed on the AAA map as a scenic route. I think that was overstating it, but it was good enough. There were train tracks more or less parallel most of the way. We enjoyed the several trains that passed, 10 or more over the day. Eventually we hit I80, and made it to Des Moines, where we stayed on Weds night. Yesterday we drove all day and stayed in Indiana. Today we should be home, and this will be my last post. Wednesday morning at Greg’s, there was some confusion about when the kids were leaving for camp, and we ended up getting up earlier than needed to say goodbye to them – but it was ok, because we got to spend some more time with them. Then we drove down to Portland and got there around three. We got to see my friend Roz’s old apartment (and cats) and her new house, a lovely little cottage in a nice neighborhood, and met her boyfriend. I went with her to pick up some paint and some pizza, which we ate for dinner out on her deck. Then John went to the hotel and she took me out for desert and some “girl time” chatting. Thursday we spent wandering Portland (downtown and the eastside) and then met up with my high school friend Daniela and grad school friend Rick for dinner. We had some good food at a Thai place that was basically a bar with appetizer-sized portions of food – this let us try lots of different things. Then we went to desert with them too, then (a bit late) got on the road. We drove along I84 to Boardman, OR, which we had picked as a reasonable stopping point. In the AM I walked to town (such as it were) and walked along the river, where I saw few people and a fair number of birds. We decided our next stop would be Bozeman, MT so we called and made a reservation there for Friday night. The drive was quite beautiful but much of it was along smaller roads and the day was very long. (Luckily the last part was interstate between Missoula and Bozeman, and luckily John can handle late night driving.) Highlights of the drive included: (1) a camel in a field with a few horses (there was a sign on the fence identifying him as Izzy and saying that he was available for birthdays etc.) (2) a stop at a gas station that also sold horse feed (3) dinner in a tiny town a bit before the entry to the Nez Perce and then Lolo National Forests where, at about 6 PM, they told us it was another 4 hours to Missoula (turned out to only be three, or three and a half) (4) a brief chat with a couple of bikers at another gas station whose t-shirts said “veterans for peace” and who told us it was less time to Missoula (yeehaw). Driving in the country at sunset tends to be gorgeous, though the downside is that it usually means there will also be driving in the dark later. We got to Bozeman quite late but slept well. In the morning I checked online and found a breakfast place called Stockyard Cafe that was sufficiently off the beaten path that John didn’t quite believe we were on the right road as we drove to it. But we were, and it was good. Seemed to be a bit of a locals-in-the-know place but also, clearly, there were lots of visitors – presumably most of them found them the same way we did. The food was good and the atmosphere was fun and a little funky. The waitress got irked at John for taking pictures but forgave him when it turned out they were both cat people. Saturday morning we headed off towards Yellowstone. We entered from the north and drove along the northeastern corner of the loop, leaving at the eastern entrance. We saw lots of dead trees (oddly beautiful), several buffalo (oddly close and non-threatening, though the signs suggested otherwise), three or four American white pelicans, and the “grand canyon of Yellowstone” which also entailed a couple of waterfalls. We also stopped at a few random places along the road. We didn’t walk up to the (single) petrified tree, framed by a fence, but did go for a short hike by the grand canyon. It was interesting that although there were dozens of people on the paved walking path and the “view” areas, virtually no one ventured onto the trail although it was clear and not really that steep – we only saw two or three others. We headed out of Yellowstone going east, toward our night’s desitation of Sheridan, WY. It was sunset and really, really gorgeous, very quiet and peaceful. John took some nice pictures of the moon rising over mountains when we stopped to clean up a spill in the car. We saw the Buffalo Bill State Park and dam (yet another dam!) and drove through a really cool tunnel. We stopped in Cody for dinner, where we asked a random man with a child where was a good place to get dinner and it turned out he was also a traveller. He said he was from Europe (Hungary; I asked) and that he wouldn’t eat at an Italian restaurant (which he had walked by a few minutes earlier) here in the US. We ended up at a fairly nice restaurant where John had a ball (not slice) of steak that was listed on the menu as a “baseball” cut and I had lamb chops. Then we kept driving east. There was some construction, which was a bit disconcerting, and what appeared to be a small airport (later googling suggested it was an airplane museum/graveyard of some sort) outside of a tiny town called Greybull. Stopped there for gas, and John wanted to buy a Redbull in Greybull. Done. Kept going and ended up in the Bighorn National Forest. No one at all there – we passed maybe one, maybe two, cars for the next two or three hours. There were some signs pointing to rock walls stating the type of rock, or maybe it was the layer, and the age — in 100s of millions or in billions of years. One of my goals for this trip had been to see the Milky Way. This seemed like the perfect place to try, though the full moon seemed likely to interfere, so we stopped at a lookout. Alas, John asked, “what is that light?” that was showing on the rock wall opposite us – the moon was so bright that at first he thought it was artificial light. Very cool, but not a prayer of seeing the Milky Way. On and off we have been listening to Heinlein’s The Cat Who Walked Through Walls. Somehow it seemed particularly fitting on this part of the drive, which felt almost sci fi all by itself. Closer to the interstate, passed a town where the population was listed as 600-something and at least 100 people were standing outside a single building. This at somewhere around 1 AM on a saturday night. Sunday morning we drove through lots of nothing to Moorcroft, WY, which was the exit for Devils Tower. The only notable thing on this part of the drive was the absence of cars and the fact that I saw a completely unmarked exit off I90 that was a dirt road. We also saw a coal plant of some sort just east of Gillette. On the way to Devils Tower we tried to help a guy whose diesel pickup had broken down. No luck except for letting him use my cell phone, which actually got service (as opposed to his or John’s). Several other people also came by and offered suggestions or sympathy while we tried to help. After a bit, we drove him to a nearby KOA so he could, he hoped, talk to his insurance people from a landline. We went on to the tower itself. We went on a short hike around the tower and took lots of pictures. It was a nice hike and a nice area, but in some ways I thought the tower itself was more impressive from a distance. I did like that there seemed to be an effort to balance mainstream tourism with the Native American regard for the place as a holy site. We then stopped in Deadwood for dinner. It turns out that pretty much everything in Deadwood is inside a casino, so we ate at a Chinese restaurant in a casino. Then came along to our motel in Rapid City and got here at the ridiculously early hour of 10:15 PM. This one is owned/run by a couple, and they usually close the office at 10. The man had said he’d leave our key taped to the door, but he had instead kept the office open and greeted us himself. Very nice. Monday – yesterday – we had bagels in Rapid City for brunch. A man came by, asked if we were local, and told us that this restaurant belonged to his son and daughter-in-law. Then we drove around a bit, checking out the woods in the area. There are several one-lane bridges that frame views of Mt. Rushmore. We also took an 1880s steam train that went from Hill City to Keystone and back. It is the only working model of this type of train left in the world. Pretty cool to ride, but kind of sooty from the engine. Interesting to see things along the way, too. Dinner in Hill City, then we went to Mt. Rushmore, saw the statues at sunset and heard part of a performance by a military band. We saw a goat silhouetted next to the statues, but had decided to try to enjoy something without the cameras (except the iphone, which barely counts) and so we weren’t able to take any pictures – though it was kind of cooler for just enjoying it as is without trying to catch it. Stayed at the same motel as Sunday night. Today it is off to the Badlands. Thursday night we stayed in Sandpoint, Idaho. In the morning before we left, we went for a walk down to the lakefront, supposedly just a few blocks from the hotel. Stopped a man and asked how to get to the actual water, which we seemed to be missing. Got to the city beach & took a few pictures, but didn’t really walk along it. Got some drinks at a local coffeeshop on the way back, got in the car, and left only ~an hour late. We stopped at a small Mexican restaurant at the outskirts of Spokane for lunch. The waitress’s kids came out with her and, when she learned we were heading to Seattle, she talked about going to Olympia to get their liquor license. She said “this is homemade” and “that is homemade.” The food was good – fitting since it was all homemade. There was lots of icky traffic in Spokane, especially given how little we’d seen over the last few days. I was surprised – though I must have driven this before – that much of eastern Washington geographically seems a lot like North Dakota, only with 100x more traffic. We got to Greg’s in West Seattle at around 7:00 and went to dinner down on Alki, where we ate just across the street from the shore. Saturday morning Greg and John got haircuts down in Pioneer square. Greg’s younger daughter sat with John for his hair cut, and we have photos documenting the event. I sat with Greg’s older daughter and drank tea and chatted. Afterwards we walked to elliot bay cafe for coffee & cocoa and then down to the waterfront. Great view of West Seattle across the water, and of Seattle sky scrapers behind us. We went to an Italian bistro Greg likes for lunch and sat outside in the sun. I had pasta with shrimp and some sort of cream sauce with orange in it. The orange appeared to be actual pieces of pulp, intact little cells. I have seen these kinds of cells from lemons and limes but did not know you could do that to an orange. We had clams for an appetizer, and garlic bread and bruschetta. All the food was fantastic. We took up a table and a half, and as we were finishing, another couple asked if they could use the other half of our table. Sure, and we gave them the end of our carafe of wine as well. Saturday afternoon was a birthday party for one of Greg’s daughters, and we met some of the parents. Sunday morning we did the crossword puzzle and in the afternoon we took the kids to the movies. We went to an Indian restaurant in Freemont for dinner; again we sat outside. Walked a bit afterwards, mostly down by the waterfront. We saw the drawbridge open, walked under the Aurora bridge, saw the troll. Saw the Fremont rocket and the statue of Lenin. Oddly, it seems I didn’t spend a lot of time in Fremont when I lived in Seattle – though I knew the troll and the statue of the people waiting for the bus, I had not seen these other things. Monday morning I met up with my friend Christie from grad school and her son. We picked up bagels and coffee and went to the playground in Lincoln park, where we did standard running-around-with-a-toddler-stuff but also managed to talk a bit. In the afternoon we brought Greg’s daughters to the Ballard Locks and saw the fish ladder and the locks in action. (This, like the Fort Peck Dam, is run by the Army Corps of Engineers. I thought this might turn into a minor theme for the trip, but the Hungry Horse Dam appears to be run by a different agency.) In the evening I drove by the places I used to live (one house has been painted green; another has a new fence) and then met up with another grad school friend, Doreen, for dinner. We had interesting food and a good conversation, and as a bonus it turned out that she had several suggestions for the next not-well-planned part of our trip, going east from Portland. This morning we went to Discovery Park, one of my favorite places from my time in Seattle. It would not have been obvious or particularly easy to get to from my neighborhoods, and I wondered how on earth I had ever found it in the first place. Then I remembered that when living here I had gone on a kick to explore different parks in Seattle. We walked along the bluffs (now significantly more restricted and therefore not quite as pretty as they used to be) and along the south trail to the lighthouse. Sometimes I am wary to revisit places, music, books, etc from my past – some things just don’t live up to my memory – but other than the bluffs being more restricted, Disco park was just as I had remembered it, and I was happy. Later we purchased salmon, sausage, and some veggies at pike place market and had delicious homemade dinner. All in all a lovely few days. Many thanks to Greg and his family! After a lot of driving, we got to Glendive, MT at maybe 9 or 10 PM. This is where we would have to turn off 94 to go north to Ft. Peck, and we wanted to stay there, but apparently there were no rooms in the whole town due to an influx of people because of something to do with oil. The woman at the front desk of one hotel told us there was one motel in a town called Circle, on the way up to the dam, though she had never been there and couldn’t vouch for it. As we were leaving, a guy with a small truck who was also searching for a room came in. He was also heading north, so we followed him to Circle, where there was only one room in the motel. He kindly told us to take it, walked out the door, and got back in his truck. I am not sure if he drove to the next town or just slept in the truck. Circle is a tiny town, and the proprietor of the motel came out in her bathrobe to take our money and give us the room key. There was a three dollar discount for paying cash. The room itself was old and worn, but clean, and there was a fridge and a microwave. Before we got back on the road in the morning, we walked around for a few minutes and took pictures. A long-haired guy mowing the lawn asked if we were photographers and started talking with us. There was an old drill bit from an oil rig sitting in the yard as decoration. It had Chinese characters on it. He told us that the joke used to be that they were drilling to China so he looked up how to say “entrance to China” in the library and painted it on the side of the drill bit. I am not sure if this is true, but it’s a good story. He asked where we were heading and when we said Ft. Peck Dam, he was the first person who didn’t look at us like we were kinda insane for this plan. He suggested we go west on 200 and then north on 24. Rte 200 was rolling hills/pasture, but 24 was full of buttes that were just gorgeous in an almost otherworldly sort of way. Got to Fort Peck and stopped at what turned out to be the spillway to take a bunch of pictures. Then we went to the “interpretive center,” a small museum. We looked around there and learned that apparently T. Rexes are only found in North America, with a prime specimen having been found nearby. Who knew. We arranged to go on a tour of the powerhouse, which started at 1:00. We asked for a good place for lunch and were sent to a small restaurant slightly past the town itself. When we walked in and looked around, an older man sharing a table with a teenager said that we should sit with them, so we did. He was from the next town east, about an hour away. He had brought the girl, a neighbor, to help him fix up his boat and was now buying her lunch. We chatted a bit and asked about all the cows we had seen at what appeared to be small farms. Were all of these places making “grass fed beef” to sell to yuppie foodies? He said that they just get the cattle started and then sell them to the big feedlots. The tour itself was pretty interesting. Although we weren’t allowed to take pictures, it seemed that we got to see most of the inner workings. It was striking how clean the place was, despite having been a working power plant for over 50 years. The tour guide was a nursing student on a summer job and didn’t know much beyond what she had been told, but between that info and bugging John I learned at least the basics of how dams generate power. Then we got back on the road, driving along Route 2 across the northern part of the state. Lots of space – I understand “Big Sky Country” better now. Stopped at Havre, a town of ~9000, at about 7:00 for dinner. I asked our waiter what the next town west was that would have a place to sleep, and how far it was. He told us Chester, with two motels. Chester was an hour away so we initially decided to just stay at Havre but no luck – no one there had any rooms. One desk clerk told us that there were lots of government workers in town because of a recent flood south of the area, and we did pass some FEMA trucks in one of the hotel lots. Moving along… The first motel in Chester was full. The second one looked scarily seedy. So we called the next town… and the next one… no luck. They told us the closest hotel rooms to be had were in Great Falls, which was something like three hours south. We had hoped to stay east of Glacier National Park and drive across on Going to the Sun Road the next day (Wednesday), but it seemed that wasn’t going to happen. 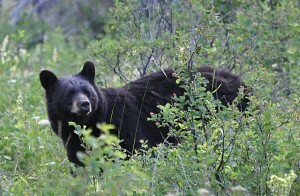 We drove across the south end of the park, on Route 2, and ended up in Kalispell at about 1 AM. Apparently there were no rooms in Kalispell either. After trying a couple of hotels, we ended up at a total dump called the blue & white motel, where we got what had to be the worst room in the place. Perhaps it actually was the last room available in the whole town… or state. Got back in the car and went up to Logan pass, where we took the obligatory continental divide photo, then back to Kalispell for the night. Today we went back to Glacier for a couple of hours. We took a side road off to the northwest and saw completely different terrain – relatively gentle hills and lots of conifers, many of which had been burned. We went for a short hike at the very end of this road, a loop through burned area that had been regrowing for 10 or 20 years. 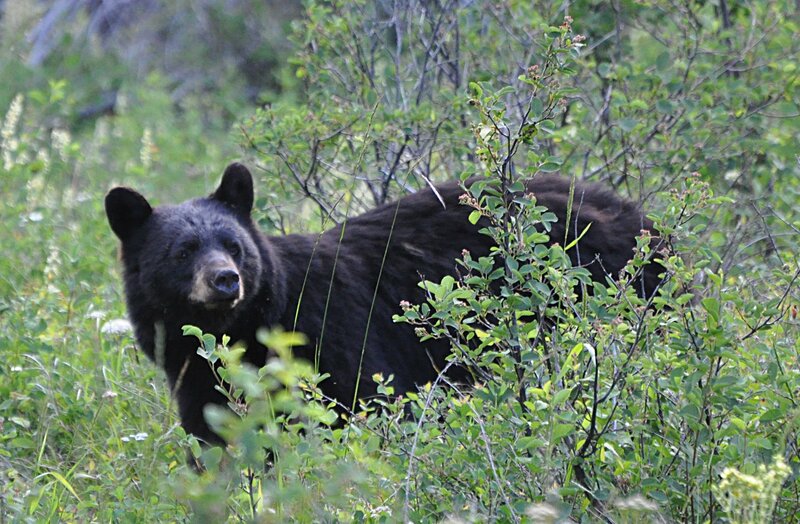 There were conifers, birches, huckleberries, a few wild strawberries, and what appeared to be a tiny rose bush. Then it was back on the road, to Libby, MT for dinner, and on to Sandpoint, ID for the night. Tomorrow: Seattle. Saturday morning I took a walk with Michele and her kids to the library and the farmer’s market. We got minidonuts (made right there in an oil bath with a little catapult that flips the donuts to fry the second side and then out of the oil) for the kids and a chocolate scone to share for me and Michele. I got a pint of blueberries (gone by dinnertime), and we got lots of veggies – and basil, can’t forget the basil – to use to make pizza for dinner that night. Then Roland and John came down and met us for lunch. At some point I had handed my camera to one of the kids, then Michele handed hers to another, and they had lots of fun taking pictures of just about everything as we walked down the street to the restaurant. Ended up in a brewpub whose name I have forgotten. They had little grab bags of toys for the kids, and the food was good. After that we went back to the house and hung out. I read a little to Michele’s daughter, and we played more with the cameras, and there was much light saber fighting. (I largely stayed out of it. John got attacked plenty.) Dinner was pizza with the farmer’s market veggies, plus goat cheese and of course mozzarella, cooked on the grill. Awesome! Sunday we visited my friend Andy and his girlfriend Razia in Milwaukee. I’ve known Andy since like second grade but hadn’t seen him in years. They took us on a grand tour, including a restaurant right on the river, a walk along the river front, a stroll through the bastille day festival, a driving tour of the lakeshore and the northern part of the city, and dinner at a restaurant in the Third Ward (maybe I should pay more attention to the names of restaurants) where we sat in an open area still inside but looking down on the actual porch so we could check out other people’s meals from above. This was kind of cool – food looks more artsy from five feet up. It was a lovely day, a nice exposure to a city I had never seen, and great to visit with an old friend and meet a new one. I also learned that lakes can indeed have beaches. Trip is off to a good start. Thursday John posted on facebook that we were headed to Cleveland, which I had fairly randomly chosen as far enough to drive in one day, allow us to see a movie that night, and still get to Chicago by Friday dinnertime. This post resulted in a surprise email from his friend Claire inviting us to her place on a lake in Michigan instead. It took us a bit longer than expected to get there due to serious rain near Toledo, but we made it by about 10:30. I slept well there for what seemed like the first time in weeks, and we had a lovely visit with Claire and her Aunt Fay in the morning, with breakfast on the lakeshore. Went for a short walk in the neighborhood, then headed off towards Chicago to see Michele and meet her family. We stopped for lunch in Kalamazoo. Found downtown, parked, and asked a random woman on the street to recommend a good place for lunch. She suggested several, including one called Food Dance, a place with high ceilings, yellow walls, and huge paintings of asparagus spears (and presumably other vegetables, but I must confess I only noticed the asparagus) as art. It was the kind of place that took pride in having local food and homemade lemonade, and it was quite yummy. Along the way we got curious why the circular polarizing filter on the camera seemed to change effect when rotated, though we both had thought the whole point of a *circular* polarizing filter was that it would not do that. John looked this up and explained it to me, resulting in a physics lesson along I94 in Michigan. I think I mostly get it now. There are advantages to traveling with a physicist. 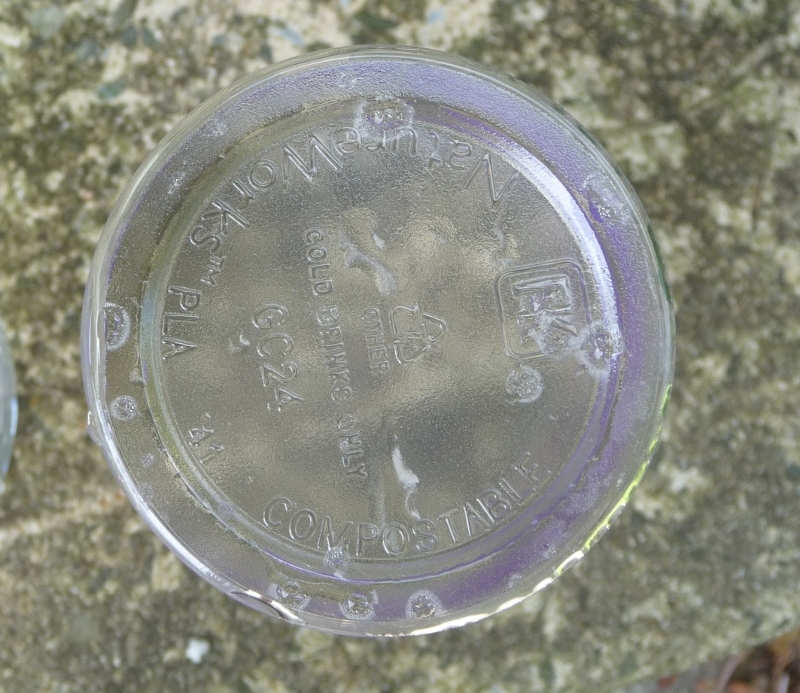 5 June 2010 - 17:16Compostable Corn Cup? At the Desert Moon Cafe I got a drink in a new kind of plastic cup. It claims to be made of corn and “compostable.” To me it is indistinguishable from a conventional PETE cup. 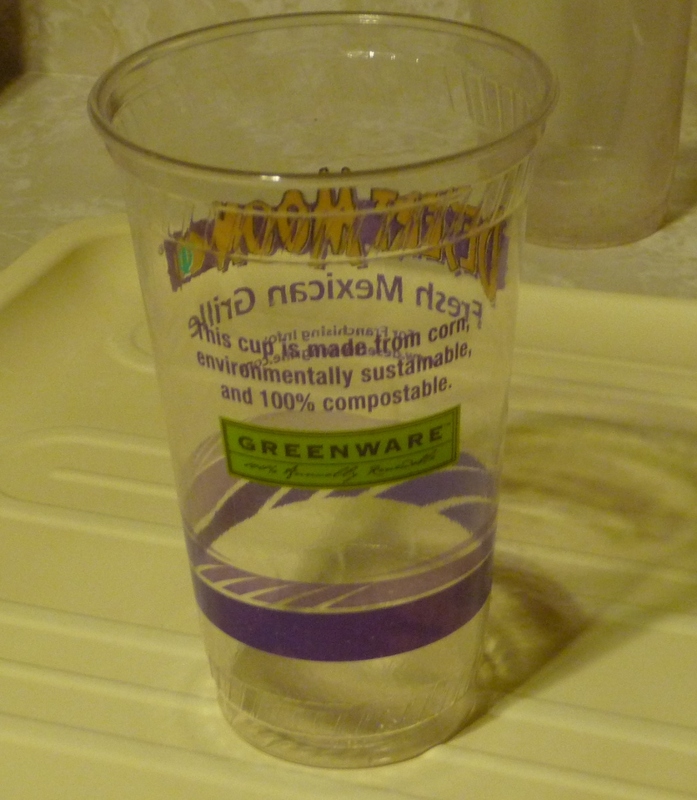 Compostable plastic cup, after one week on counter. The PETE control cup (left) and the compostable cup (right). The cup claims to be compostable and is plastic type 7. I buried the cups in the ground (today, June 4 2010) and will check up on them in a month or so. 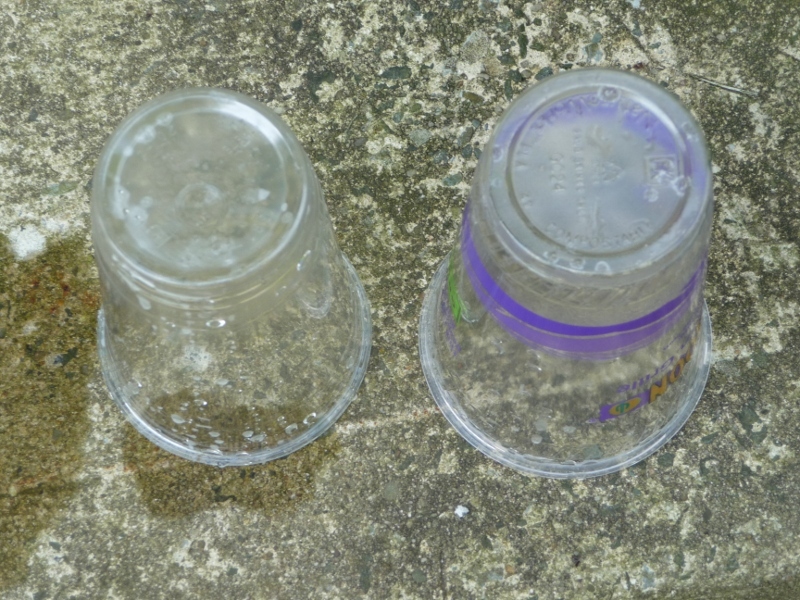 Test site with cups inserted. Worms were observed (well, at least one). 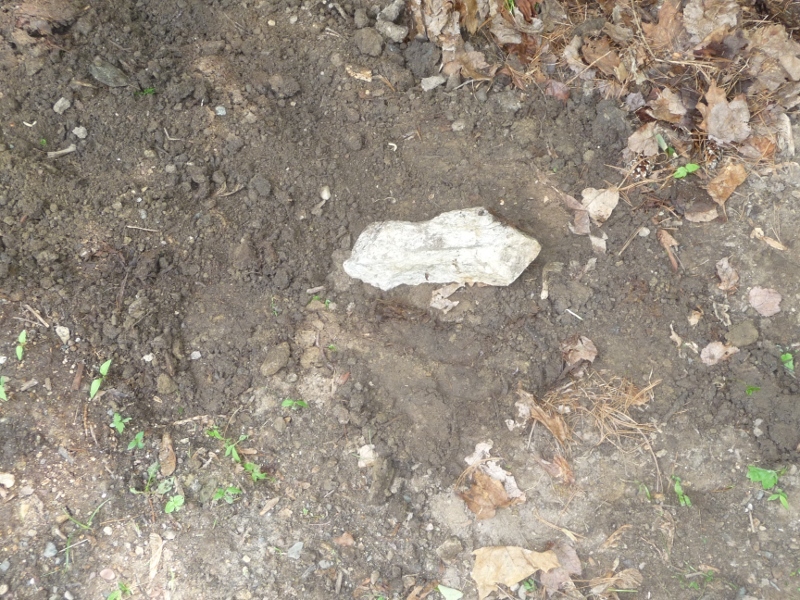 Test site after burial. Stone marks the spot.